With not a single UK manufacturer of note producing A-class motorhomes, we’re left to turn to mainland Europe for inspiration. And, because the idea of any kind of rear lounge is pretty alien beyond our shores, such layouts tend to be few and far between. But, here’s a newly introduced exception that proves there is the very occasional exception. Indeed, Pilote has no qualms about saying the 650U floorplan (which will also be available in its low-profile Pacific series) was conceived especially for the UK. From French maker Pilote, a company that’s enjoyed a long-term presence over here, the 650U is new to the A-class Galaxy line-up for 2017. The 6.5m long 650s were introduced by Pilote just a year ago, but already they’re proving popular – thus the range extension. As with any A-class, it certainly looks the part, thanks to its full-width front end and large windscreen. It might seem imposing (in fact, the Galaxy is no wider than a typical coachbuilt), but translates into more space and better insulation inside. The UK spec’ extends to GRP-clad sides here, with Styrofoam insulation. Do note, though, apart from the steering wheel on the right-hand side, nothing else changes for the UK in terms of Pilote’s build – hence the cab door is on the passenger side and the habitation door is on our offside. While Fiat’s latest Euro VI-rated 130bhp engine should be sufficient for a vehicle like this, there’ll always be the temptation to pay the extra £1,249.50 for the 150bhp unit or go all the way to the 180bhp for another £1,749.30. Pilote also claims changes in its manufacturing, as well as extensive testing, have made its latest Galaxies the quietest yet. There’s a choice of specification level, too – starting with Essentiel and going through to Sensation and top-dog Emotion, with prices from £57,419, £61,271 and £64,135 respectively. The model reviewed here is the mid-level Sensation, with upgrades such as Truma’s Combi 6 heating and hot water. 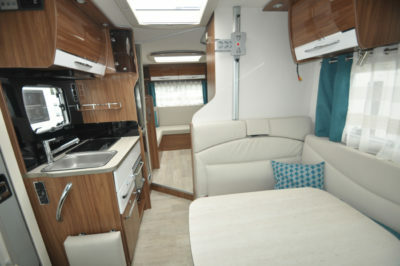 While most folk will be happy with one large lounge – not always achieved in an imported motorhome – the 650U boasts two. And, essentially, two bedrooms. Up front, there’s L-shaped seating and swivel cab seats (so much easier to operate in the wider A-class front end), with a fixed pedestal-leg table. Meanwhile, at the back there’s space for up to six to sit comfortably around a free-standing table. Headrest pieces, which seem to suit best in each corner but can actually be moved anywhere, add to the comfort as well as supplementing what are already generously high backrests. The windows at the back aren’t the largest, but daylight and ventilation are boosted by a large rooflight overhead. 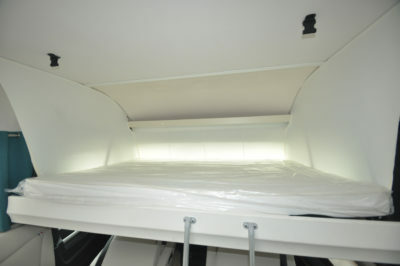 At night, the overcab drop-down bed is a decent 1.90m x 1.35m, but for size it’s trumped by the 1.97m x 1.50m of the rear lounge double, which is also particularly easy to make. If there’s a compromise, it’s when it comes to the kitchen. It’s compact, with just a two-ring hob and a separate sink squeezed together, leaving little room for a worktop, while the oven/grill will be set a bit too low for some folk. True, this is all buttressed by a 138-litre fridge/freezer across the corridor. Also opposite the main kitchen unit, a full-height tambour door to the washroom helps access, as well as a feeling of space. 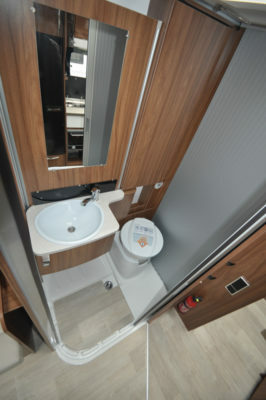 There’s a swivel-bowl toilet and a fixed basin in matching white plastic, with plenty of locker storage. But, it’s the swing wall that comes around to offer a fully-lined shower area that is the star feature here! It’s great to see Pilote has managed all this on a 3,500kg chassis (although you could have it replated to 3,650kg or even specify a heavy-duty underpinning). 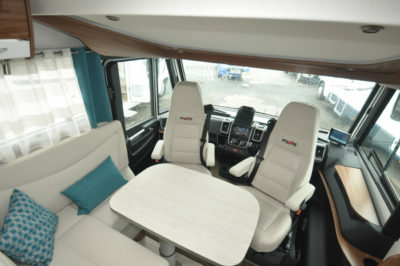 And don’t worry if you don’t fancy that rear lounge set-up. 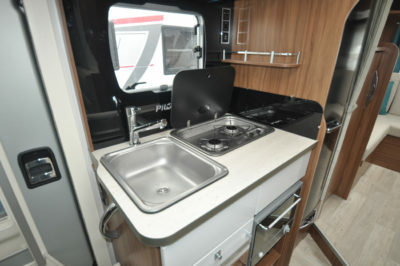 There are also same-size sister models with the 650L (end washroom), 650C (island bed) and 650GJ (twin singles). We’d love to hear what you think about the Pilote Galaxy 650U. Please add a comment below. 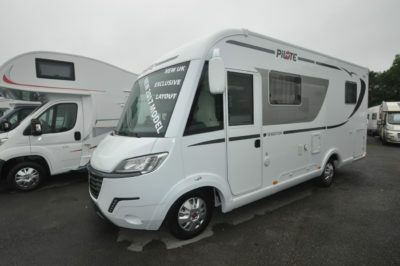 There’s more information on the Galaxy range on the Pilote website www.pilote-motorhome.uk Find out more insuring this or your motorhome on our motorhome insurance discounts page. Safety & security ABS with EBD (electronic brake distribution), engine immobiliser, driver’s and passenger’s airbags, smoke and carbon monoxide alarms, vehicle battery isolation switch. 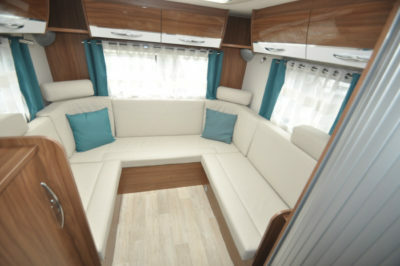 Can’t see how it compares to Mobilvetta kyacht80, which has a rear lounge and a drop down electric bed.. This is nowhere near..Certainly not for extras which all seem to cost a fortune which are standard on Kyacht..